These are goats that I am offering for sale. 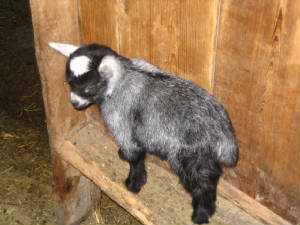 At the time of sale, all goats will be up to date on shots, wormings, and hoof trimmings. As of 4/1/2014, all of our 2013-14 spring babies are reserved or sold. We may have some kids later in the year for sale. Does are $75 and wethers are $40. Bucklings may be available upon request for $75, but I will need to know ahead of time you are looking for a buckling. Prepayment is an option to hold goats. Please do not hesitiate to email me any questions about goats! I occasionally may have goats available for sale not listed on this page, so feel free to check in on me at any time!! Thanks. 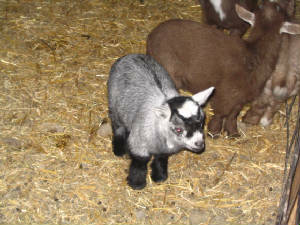 A wether born here at Maple Hills a few years back. Are you interested in being put on my mailing list? If so, please let me know what you are interested in (gender, age, color, etc.). If you would like to request addtional information, you may do that also! This was one of the twins that Snowstorm had! One of the triplets out of Eclipse- she is unique b/c she doesn't have a white spot on her head!